Kick off your visit on the 21st (Sun): don't miss a visit to Essaouira Ramparts, take a leisurely stroll along Essaouira Fishing Port, then stop by Flouka de Mogador, and finally stop by Galerie la Kasbah. To see ratings, maps, reviews, and other tourist information, go to the Essaouira vacation trip planner. London, UK to Essaouira is an approximately 14.5-hour flight. Traveling from London in May, things will get a bit warmer in Essaouira: highs are around 27°C and lows about 17°C. Wrap up your sightseeing on the 22nd (Mon) early enough to drive to Marrakech. Deepen your sense of the past at sights like Medina of Marrakech and Saadian Tombs. Explore hidden gems such as Ensemble Artisanal and Cyber Park Arsat Moulay Abdeslam. There's lots more to do: admire all the interesting features of Jemaa el-Fnaa, take a stroll through Marrakech Souk, admire the landmark architecture of Bahia Palace, and explore the galleries of Jardin Majorelle. For photos, ratings, other places to visit, and tourist information, go to the Marrakech tour planner. You can drive from Essaouira to Marrakech in 2.5 hours. Another option is to take a bus. While traveling from Essaouira, expect somewhat warmer days and about the same nights in Marrakech, ranging from highs of 36°C to lows of 18°C. Finish up your sightseeing early on the 26th (Fri) so you can travel to Chefchaouen. Kick off your visit on the 26th (Fri): explore the fascinating landscape at Sahara Desert Trips - Day Tours. 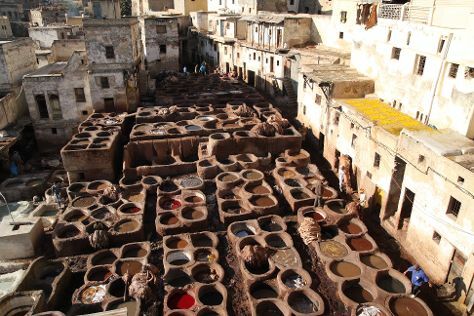 Here are some ideas for day two: take a stroll through Medina of Fez, see the interesting displays at Musee des armes, then make a trip to Borj Nord, and finally explore the world behind art at Nejjarine Museum of Wood Arts and Crafts. To see maps, ratings, other places to visit, and more tourist information, you can read our Fes itinerary maker. Traveling by combination of taxi and flight from Marrakech to Fes takes 5.5 hours. Alternatively, you can drive; or take a train. Expect little chillier temperatures when traveling from Marrakech in May; daily highs in Fes reach 32°C and lows reach 13°C. On the 28th (Sun), you'll have the morning to explore before heading off to Chefchaouen. Kick off your visit on the 28th (Sun): look for gifts at La Botica de la Abuela Aladdin and then stop by Local Berbere Artisanal. To find more things to do, reviews, other places to visit, and tourist information, read our Chefchaouen trip builder. Traveling by car from Fes to Chefchaouen takes 4 hours. Alternatively, you can do a combination of train and bus. Traveling from Fes in May, expect nights in Chefchaouen to be a bit warmer, around 17°C, while days are little chillier, around 27°C. Wrap up your sightseeing by early afternoon on the 29th (Mon) to allow time for travel back home.